Many singles are under the impression people would only join a free dating site if they were looking for a series of casual encounters. After all, surely chatting-up complete strangers on the Internet is a superficial way of attempting to connect? But nothing could be further from the truth. More and more individuals are using dating websites to embark on a quest for a serious relationship. 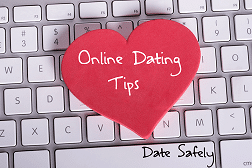 So when it comes to dating tips for the online environment, here are four to pay particular attention to. The nature of the online environment for relationships is that it can be incredibly fast. Individuals who have opted for this particular platform for connecting, as opposed to any other more traditional method, have done so because they are seeking potential partners in the shorter rather than longer term. While it does make sense to take some time browsing through all the available profiles, communication can be done instantly. As you find out more about a person's interests and hobbies, as well as the most appealing aspects of their personality, your main aim will be to find out where your goals and aspirations overlap. If you can suss out what you have in common, you will have a building block for a serious relationship. The online environment can sometimes seem like a busy street market where so many hawkers are vying for your attention, making superficial statements to attract the gullible. If you are sincere about your request to come across someone who will be your ideal partner, there is no point hanging about trying to be polite with people who clearly aren't right for you. So forget about tact. If someone is persistently messaging you online without actually giving any impression of being that interested in commitment, all you have to do is block them. Quickly move on to the next person in your search for someone who is not going to be wasting your time. The online environment is perfect when it comes to connecting with a potential partner in a discreet environment where you can get to know each other by sending a series of messages. In this way, it is possible to build an excellent rapport and a degree of chemistry. But if you really want to embark on a serious relationship, you need to put a face to the person as quickly as possible. Being able to see each other’s profile photographs is all well and good, but in order to get the fullest impression of the character with the potential to be a love interest, you need to see beyond the flowery prose and entertaining texts. So you should be prepared to make the transition to web chats early on in your relationship. Once you start talking on Skype you will have a much more rounded and accurate idea of who you are talking to. Exactly the same as relationships in the offline world, you will have the best chance of establishing a serious connection online if you follow the same rules when it comes to areas like making compromises. You might find yourself attracted to someone who has differing political viewpoints or religious beliefs. As long as none of these views are what would be considered extremist or offensive, then discuss them. Engage in healthy debate. Whatever convictions you have yourself, in order to enjoy a serious relationship it often pays to meet somewhere in the middle. How Much Do Dating Apps Know About Us?